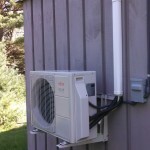 Sundog Solar Heat Pump installations accommodate a variety of customer needs and aesthetic concerns. 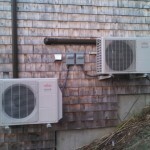 We site the heat pump equipment with our clients to ensure the best placement. 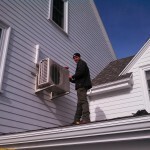 Financing is available for heat pump customers to help you start saving money right away. With customers’ input, Sundog Solar can choose an optimal location for mini-split indoor and outdoor units, such as this deckside installation in Union, Maine. Ask our customers! 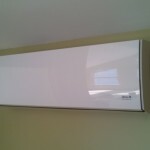 This Fujitsu mini-split heating indoor unit is quiet and efficient! 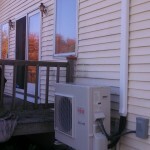 Our customer chose the popular rain cap for her Mini-Split heat pump. Consider Maine weather, it’s a great choice to guard against hail, freezing rain and extreme conditions. This duct-work conceals the copper tubing within. It’s the ocean you want to see, and not the heat pump? Sundog Solar can help you find an aesthetic solution. 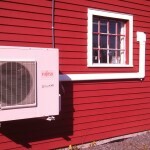 These new Mini-Split Heat Pumps not only do double work, heating and cooling, but they are very unobtrusive. 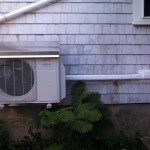 If you look closely at this 15RLS2 outdoor compressor in Searsport, Maine, you’ll notice the grey electrical disconnect. This allows for safe repair-just disconnect from the power source to avoid electrical shock. 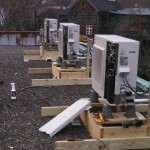 Of these three 24k btu outdoor single-zone compressors, each one supplies a 24k btu indoor unit at a commercial location in Dover Foxcroft, Maine. 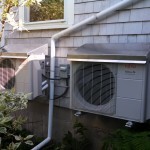 Our customers are discovering the flexibility of multi-zone mini-split heat pumps! 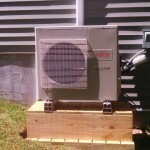 This customer is using two single zone Mini-Split units to heat and cool separate spaces. 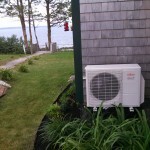 36k btu ground-mounted heat pump in Belfast, Maine. 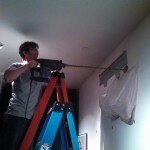 Ground-mounting reduces the amount of noise in the house. 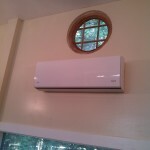 Mini-split heat pumps can be installed high on the wall or lower to the floor. 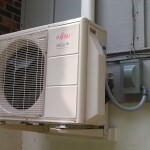 Some of customers’ needs require installation higher on a building.